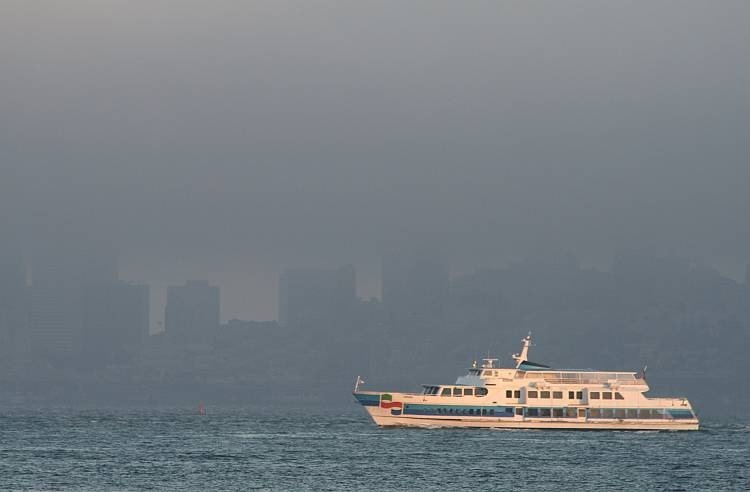 Normal serviced was resumed this morning with the reappearance of the famous Bay Area coastal fog. It soon receded from our immediate vicinity but we could still see it a little further west over the coast. This may have explained the frequent camper vans and assorted recreational vehicles which kept heading inland on the Tomales-Petaluma road; curtailed weekend trips, perhaps. Our morning was brightened by the very welcome surprise visit of our friend, Michael Borse and Denice, his wife. They adopted the silent approach and arrived, very energetically, on a tandem. An impressive Sunday ride from their house almost 20 miles distant, and they weren’t finished yet. It was so great of them to call in and see that we had arrived safely. I look forward to seeing them again. In the evening we were destined to join an Italian wine tasting with appetizers cruise around San Francisco bay on the Angel Island ferry. We were getting together with more friends and former colleagues, Steve and Kathy Delman (who had kindly arranged our tickets) and Fred and Lorraine Webster. How better to renew friendships than over several glasses of wine? Mid-afternoon arrived and off we set. I had selected the most direct and most interesting of the three available routes. This took us down the side of Tomales Bay and then along Lucas Valley Road where George Lucas of Star Wars fame has his Skywalker Ranch. (I guess you’ve truly arrived when the road you live on is named after you.) All I had to do was follow the pleasantly spoken American lady’s instructions to the letter and keep her satisfied. This was great; brainless driving at its best. The accuracy of the system seems almost good enough to take control of the steering wheel and leave me as a passive passenger. I thought I’d switch my brain back on for the return journey. The coastal fog was persistent and, as we boarded the ferry in Tiburon for the booze cruise, was thickening as it swept in over the coastal hills, the Golden Gate Bridge and San Francisco itself. Being forewarned, we had our fleeces with us so the worst of the cold was kept at bay (no pun intended). The bottoms of my zip-off convertible trousers would have helped even more but were, sadly, back in Tomales. 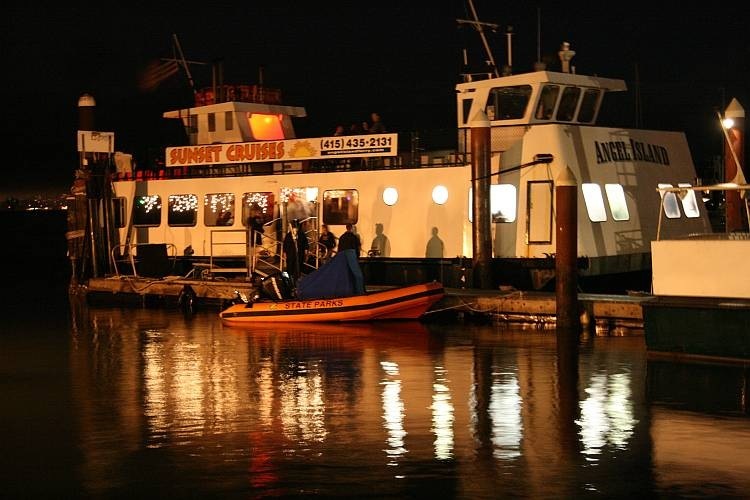 Being a ferry, the accommodation was a tad basic but the wine and appetizers were quite pleasant. Some additional seating/tables would have helped, too. I couldn’t help but notice that the ladies seemed to be getting more generous tastings than the men. So much for sexual equality. Having braved the elements watching the lights turn on in all the surrounding expensive communities as the ferry chugged in circles around the bay, we eventually retreated inside until the ferry docked. A warmer, clearer evening would have helped everyone feel that the three our trip wasn’t about an hour too long but, hey, this is summer in San Francisco.